Reducing energy consumption and Carbon emissions is an on-going challenge for all commercial organisations. According to the Government’s ESOS (Energy Savings Opportunity Scheme is a compliance scheme for large companies), 75% of the organisations audited could make energy savings in excess of 23%. In a typical commercial building, boilers, chillers and blowers can be triggered to run by any one of a huge number of devices which are programmed to come on and go off based on a number of factors such as temperature, time or demand. However, any one of these components can fail or malfunction. Without thorough investigation, these failures are extremely difficult to detect. So most organisations will not know where their energy is being wasted. Whether your property is a retail shop, factory, warehouse or office, likelihood is you will be consuming the majority of your energy during the day. Consequently installing a solar system could be the most efficient way to reduce both energy costs and Carbon emissions. As an example a 50 kW solar installation requires around 350 m² of roof space and will generate 50,000 kW hours of electricity and 22.5 metric tons of CO₂ savings per year . At current rates this equates to around £6,500* in annual savings and £2,160* in FiT payments. Which means combined annual savings of £8,660. As of 1st January 2017, Evergen are able to offer finance for Solar installations at very competitive rates. Finance is available for up to 60 months and based on a lease model (off balance sheet) without affecting your debt/equity ratio. Vast majority of Public Sector buildings are old, not well insulated and have huge energy demands. Evergen has installed solar on dozens of Schools and Council offices in a number of Counties including Surrey, Berkshire and Buckinghamshire. 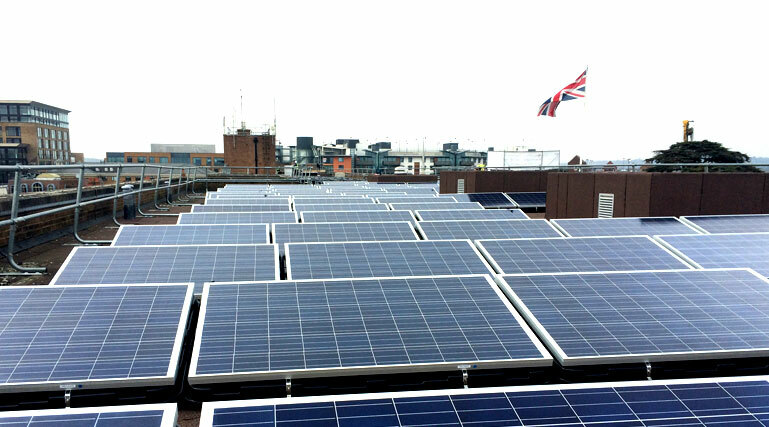 We have installed solar on some iconic buildings such as the Town Hall of the Royal Borough of Windsor & Maidenhead. Why Get Solar Panels On Your Building? To be able to qualify for the Government scheme’s Feed-In Tariff, you will need to make sure that your property is has a energy performance certificate rated C or above. This essentially provides important details on the current performance of your property and how you can improve the energy performance. Evergen Solar has extensive experience in fitting solar panels to an array of roof types. This means that whether you have a pitched, flat, trapezoidal or corrugated roof – we can have you using renewable energy in no time. Evergen will send out specialists to survey your property, we will take a look at all aspects of your roof to ensure that you can get the optimal performance from our specially installed solar panels. Many often worry about the shading, this is when our solar panel specialists will come into action to advise and answer any queries you may have. 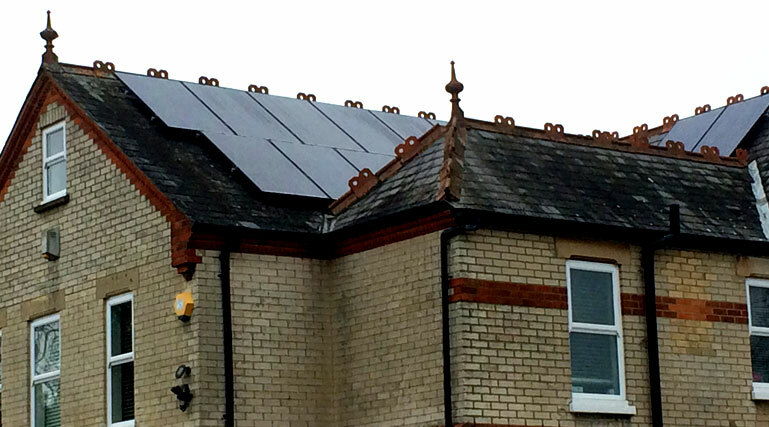 SURVEY: Our solar surveyor will survey your roof and electrics. QUOTE: We will then prepare a quote detailing costs and returns. DNO: Once we have the order confirmation, we will apply for DNO consent to connect the Solar generator to the grid. INSTALLATION: Once DNO (distribution network approval) has been received, we will schedule the installation. Get a quote today for commercial and public sector solar panel system installations!